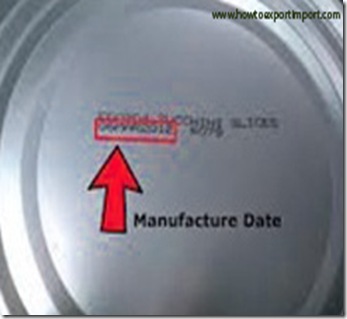 Shipment date under Letter of credit - Can shipping line predate Bill of Lading. Can shipping company mention BL date if shipping bill date obtained from customs? What is the earliest date can be mentioned on Bill of Lading. You have obtained an export order under Letter of credit (LC) mentioning ‘shipment to be effected on or before 31st March’. As I have explained previously, bill of lading can be issued only after completion of customs procedures. Means, the cargo can be handed over to carrier once after completion customs formalities. You have filed export customs documents on 30th March. The cargo has been moved to nearest container freight station on 31st march. However, due to some technical reasons, the customs formalities could not be completed on the said day, although you have filed shipping documents. Filing export shipping documents and obtaining shipping bill number does not mean that required formalities completed. Once after obtaining ‘let export order’ from customs, the necessary export formalities are completed. In this case, the ‘let export order’ obtained on 1st April. The date of Bill of Lading is the proof of shipment date and bill of lading will be only issued after the date of ‘let export’ order, although you have obtained shipping bill number on 30th March. Remember, your Letter of Credit expires if shipment not effected before 31st March. If you mention the date of BL as 1st April, your banker will not negotiate your export bills as they find this as a ‘discrepancy of documents’. Also you do not get payment from overseas buyer’s bank as you have violated terms of documentary credit. Some of the shipping lines or carriers correct the date of shipment as 31st March unofficially to satisfy their exporters to help them in honoring the letter of credit. However, as per maritime law, this is ‘fraudulent’ activity and can not claim any insurance or other related claims. Here is another example: You have another order mentioning about the time of shipment in Letter of Credit as ‘shipment has to go on board’ on or before 31st March. In this case, you need to get your goods on board the vessel on or before 31st March. If you are situated in a place far from port, you need to plan to get on board well in advance, so as to enable the goods to be shipped on board on or before 31st march. If you are arranging customs clearance from a container freight station (CFS), the said cargo has to be reached port in time after completing customs clearance. Say, you have moved cargo to container freight station by 20th March. The customs formalities completed on 22nd March and you have handed over shipment to carrier to move the port of loading. The cargo reached on 29th at port of loading. Vessel arrived on 30th and your cargo loaded in to container on 31st and got ‘on board’. So you can obtain ‘ON BOARD BILL OF LADING’ on 31st March. prabhakar: On 25 February 2015 can we give one chapter heading in shipping Bill and another in Bill of lading as the UK customer directed to mention the Tariff heading in Bill of lading as per UK HS Code.